The term cerebral palsy is used to describe a wide variety of disorders of voluntary movement acquired before, during or after birth - up to the age of 5 years. Voluntary movement is movement that individuals are normally able to do as and when they wish; like lifting an arm, smiling, or walking normally. Individuals affected by cerebral palsy are unable to move affected muscles under voluntary control. However, the muscles may move of their own accord, producing a variety of writhing, tightening or jerking movements. Many muscles will not be affected and contract normally. So the movement problems may be restricted to certain parts of the body. Sensation is usually not impaired. Individuals affected by cerebral palsy may possess normal intelligence and normal awareness of events going on around them. Between 0.1 and 0.2 percent of all children (1 or 2 in every thousand) will show some elements of the cerebral palsy syndrome. Babies born prematurely are more at risk. Up to 1 in every hundred of children born before 40 weeks gestation will develop cerebral palsy. 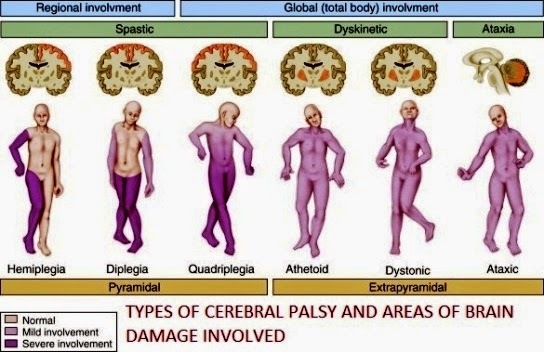 What Are The Signs And Symptoms Of Cerebal Palsy? The most common symptoms are spasticity, weakness, involuntary movements and incoordination. With spasticity, the muscles of the baby's arms, legs, neck or some other part of the body are taut and distort the limb out of its normal position. Despite this, movement of the muscle is possible, although it may not appear normal. Paralysis is also possible. The baby's arm is the most commonly affected, though hemiplegia (complete paralysis of both arm and leg on one side of the body) is also seen; as is paraplegia (paralysis of both legs) with normal movement in the arms. Quadraplegia or tetraplegia refers to paralysis of all four limbs. The affected limbs are usually shorter and smaller than normal. The muscles tend to be tight, weak, with a tendency to contract and distort the limb out of its normal position. In children who are only mildly affected, the weakness may become visible only during certain activities like walking or running. Children who have impairment of musular co-ordination all over their bodies (quadrapelgia) may also have problems with swallowing and talking. Some affected individuals also have involuntary movements of their limbs. The limbs may writhe, jerk or contract without the individual wishing it to happen, sometimes at the most inconvenient times. These movements are called athetosis, chorea or dyskinesia and occur in about 1 in 5 of people with cerebral palsy. The unwanted movements may affect any part of the body: hands, feet, arms, legs, trunk, neck or face. They increase during periods of emotional tension and disappear during sleep. Sometimes individuals have difficulty talking. Around 1 in 4 of children affected with cerebral palsy will have convulsions (epilepsy). This is more common in those with spasticity. Abnormal eye movements and difficulty with vision may also be present. Children whose problems are due to jaundice at birth may have deafness and some paralysis of eye movements in upward gaze. Although many have normal intelligence, short attention span and hyperactivity are common in children with cerebral palsy. Very often it is difficult to be sure of the diagnosis of cerebral palsy during early infancy and it is not until a number of developmental problems have been identified that the diagnosis becomes clearer. Nevertheless, it is a good idea to make the diagnosis as soon as possible so that therapy can begin. For this reason, children born in at-risk situations (for example jaundiced, premature, or after birth trauma) are usually followed up by paediatricians. Very commonly, although the diagnosis may be suspected, the complete characterisation of cerebral palsy is not made until around 2 years of age. 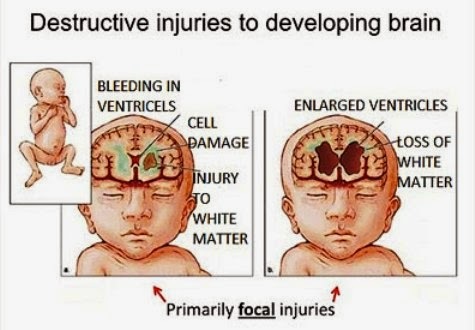 Until this time, it may be noticed that the child's development is lagging in some respects and that infantile patterns of reflexes persist past the age at which they would normally disappear. Slight spasticity may also be noticed in the muscles. There are a number of other rarer conditions that can be mistaken for cerebral palsy and it may be some time before these can all be excluded. Blood tests can exclude those that are associated with biochemical abnormalities (for example Tay Sach's disease and the mucopolysaccharidoses). CT scanning may show other causes but no test is specific for cerebral palsy. For this reason, it may be some time before other causes of delayed development can be excluded. This obviously requires an experienced clinician who is used to recognising such children. The treatment of cerebral palsy requires many health care professionals to work together with the parents and with the social agencies. The goal is maximise the patients' independence within the limits of their handicaps. Many can lead near-normal lives, attending normal schools and university, obtaining regular work and living a normal married life. Physical therapies are essential where there are disorders of movement. Physiotherapy to prevent spasticity; massage to relieve tender muscles; occupational therapy; home adaptions; orthopaedic surgery; and speech therapy may all be required at some time. Cerebral palsy is a lifelong condition. Complete independence is not possible for all individuals with cerebral palsy and many will need protected environments, initially at home and then in special schools and residential units as they grow older. Parents will need particular assistance and support if they are to continue to care for these children at home. The knowledge that there is respite care easily available can be particularly valuable at times of crisis. 3. What is the availability of respite care locally.